Just a picture extracted from this article. 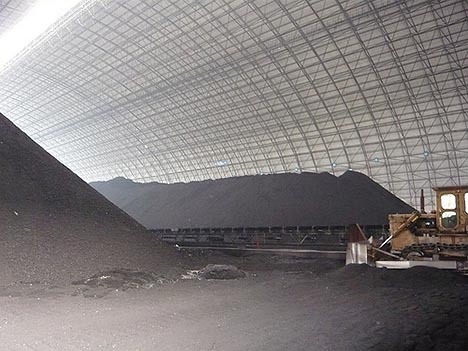 A huge building for (coal) hills! Infographic: Forget China, Who Are Really the World's Worst Carbon Polluters? Probably the most common refrain you here from anyone arguing against the United States agreeing to significant emissions reductions is, "what about China and India?" China is, after all, now the world's largest total emitter of carbon dioxide emissions. But that's not the most important emissions metric we should be focusing on. Per capita carbon emissions is a much more telling statistic. 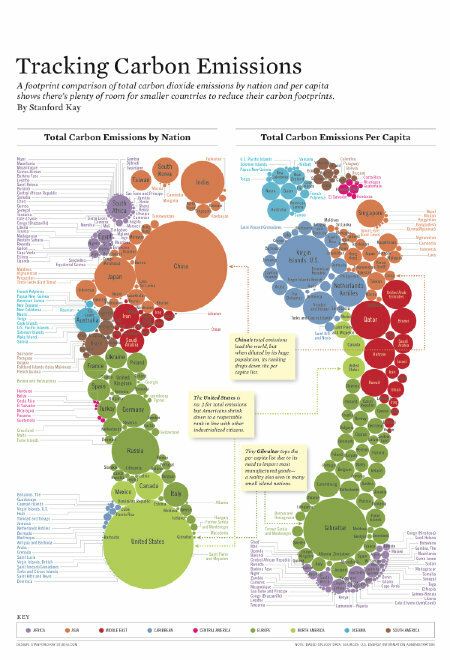 Sure, China emits the most total tons of carbon dioxide, because it also has the largest population. On a per capita basis, even rapidly developing nations like China and India have a long way to go to catch up with long industrialized nations like the United States and those in Western Europe. Designer Stanford Kay laid the two metrics side by side in a great and revealing infographic on Miller-McCune. As Kay (who granted us permission to run the graphic here) writes, "it’s clear there is plenty of room for other, smaller countries to reduce their per capita contributions to a problem that threatens all." Click on the image or this link to open the original PDF from Miller-McCune. 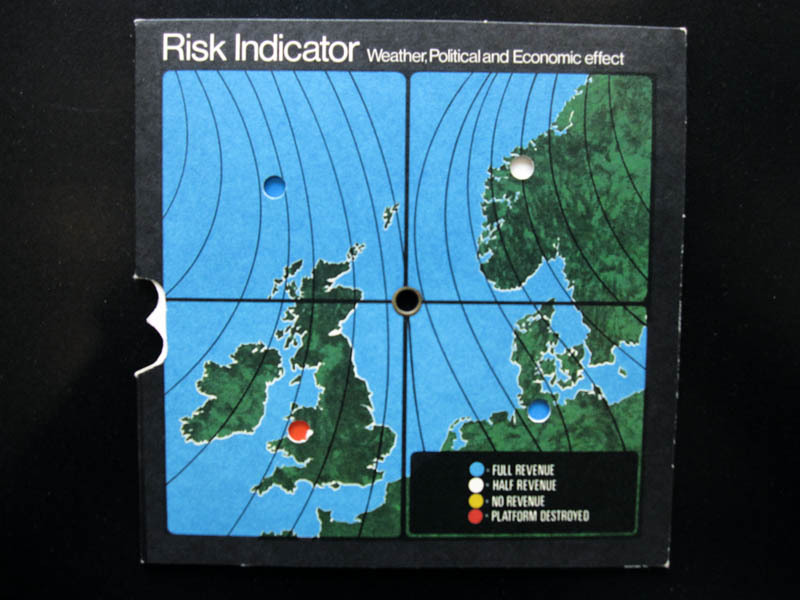 Or find more of Kay's information graphic design work on his site. ... which gives a slightly different image and possibly allows to target different and additionnal reasons for high energy consumption. 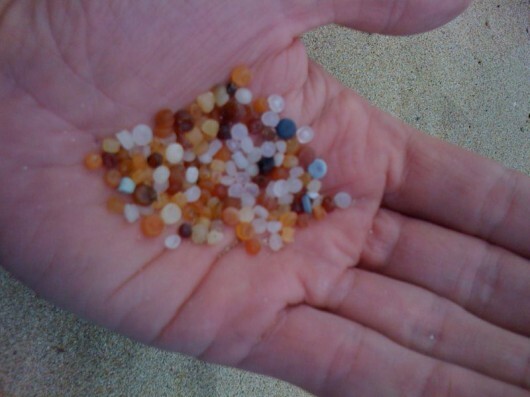 I gathered this hand full of tiny pieces of plastic on less than one square meter of beach in Greece (map). Spotted with the Next Nature Spotter iPhone app. [Image: Offshore Oil Strike by BP; photo by BLDGBLOG]. 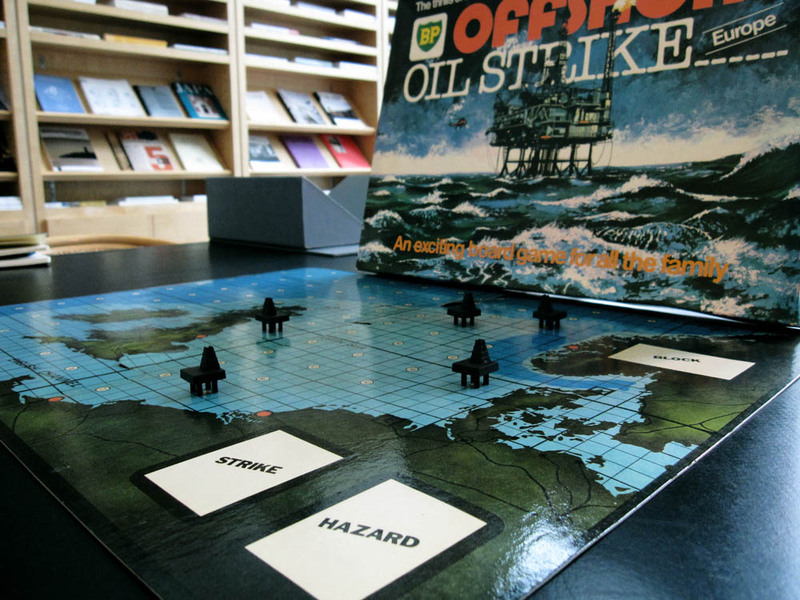 One of the most extraordinary—and timely—subcollections in the archives of the Canadian Centre for Architecture can be found resting on a few metal shelves in the basement, where you will discover stacks of old, oil exploration-themed board games. 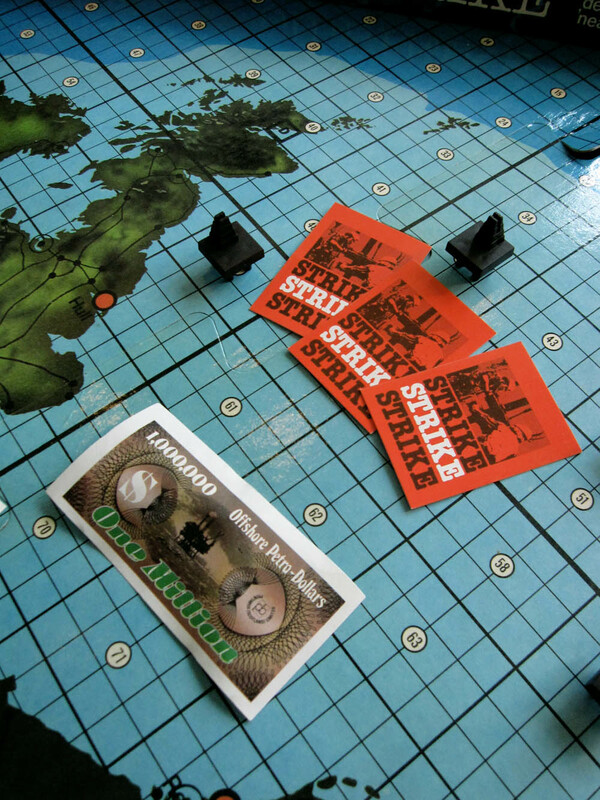 Cartel: The International Oil Game. 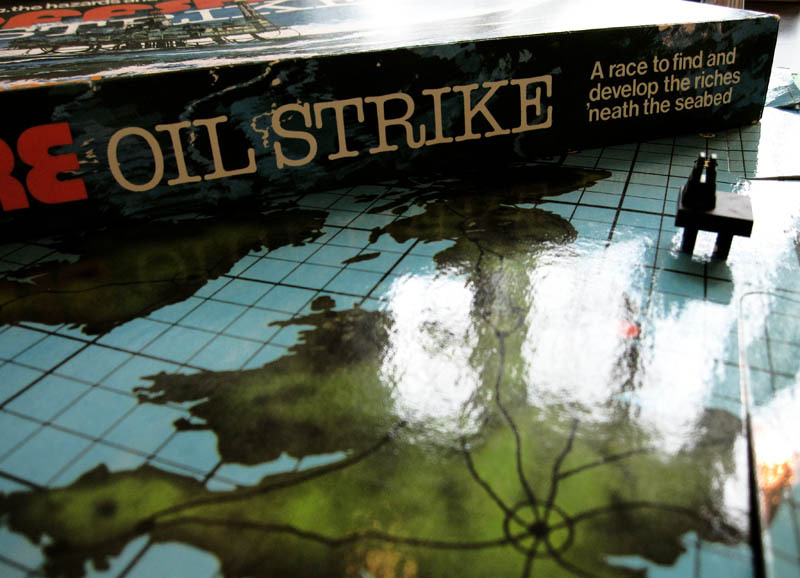 King Oil: Combine Luck and Strategy to Control the Oil Fields. 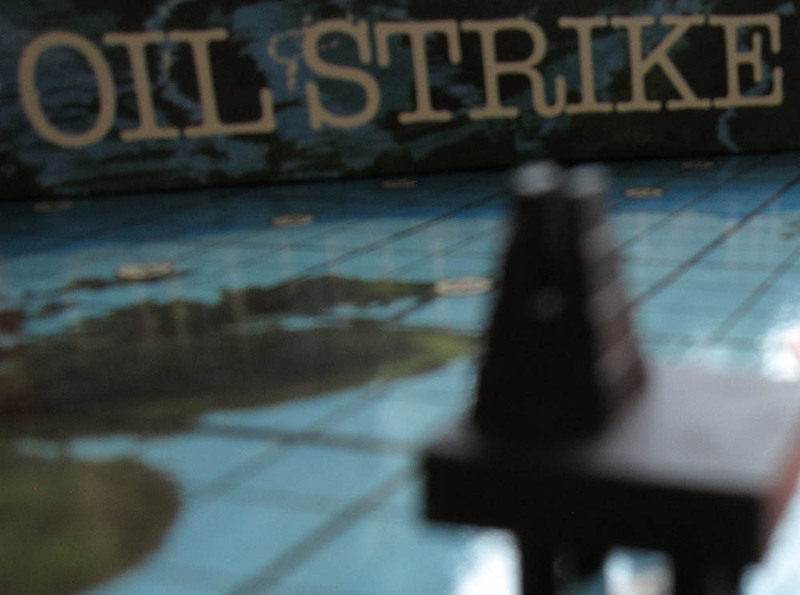 Oil: The Slickest Game in Town. 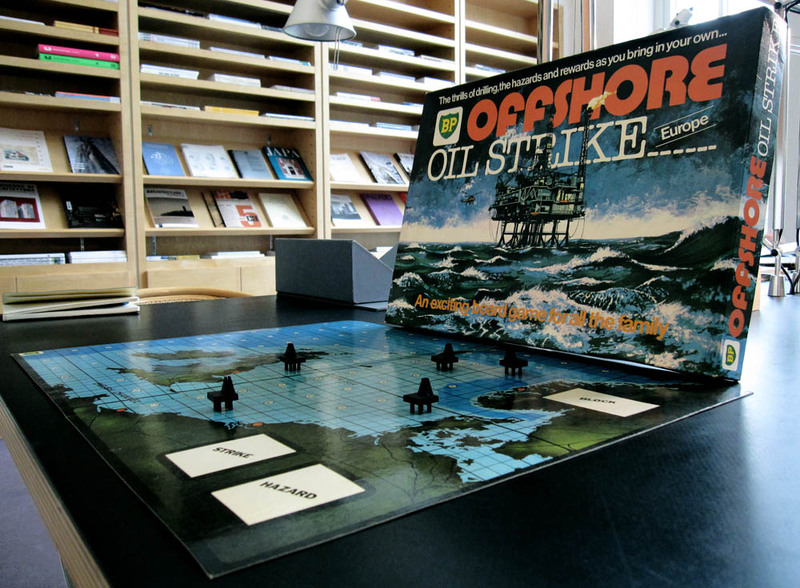 Total Depth: An Oil Man's Game. There's even the confident one-word title of Gusher, with no description or subtitle needed—or, if none of those strikes your fancy, you can always play a few rounds of Gas Crisis. 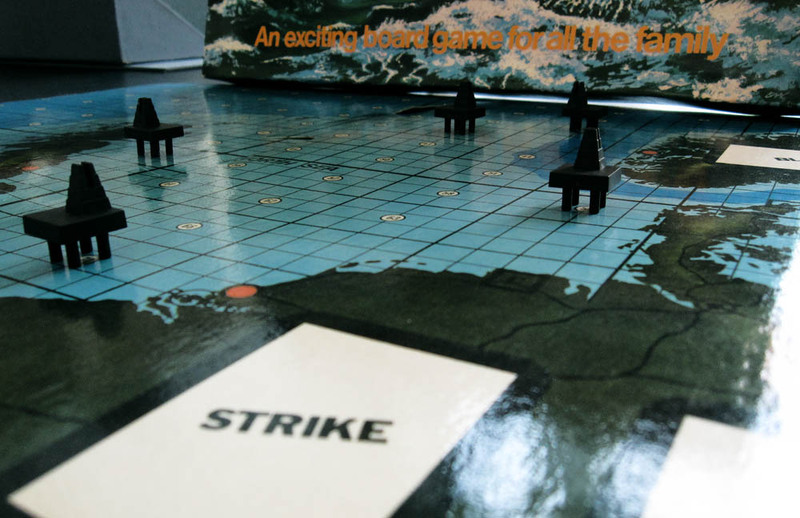 Its goals include an exhortation to "Master the Minicar" and "Shun the Sheikhs," showing that smaller cars (and better gas mileage) have been seen as tools of foreign policy since at least the 1970s, when many of these games were first released. 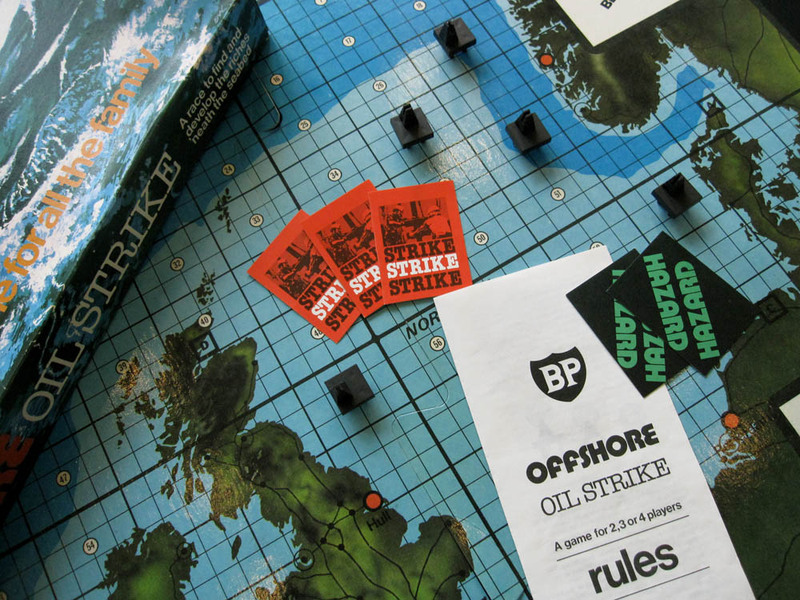 But the one game that seems particularly delirious, a kind of sad joke now, or unfortunate coincidence, is Offshore Oil Strike, "Designed and Manufactured by Printbox (Scotland) Limited in collaboration with The British Petroleum Company Limited." Offshore Oil Strike, brought to you by BP. 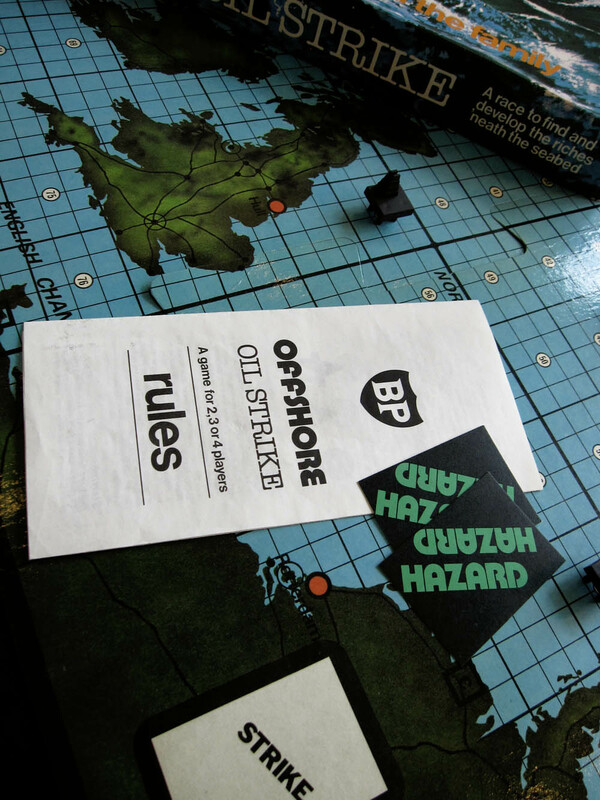 [Images: Offshore Oil Strike by BP; photos by BLDGBLOG]. 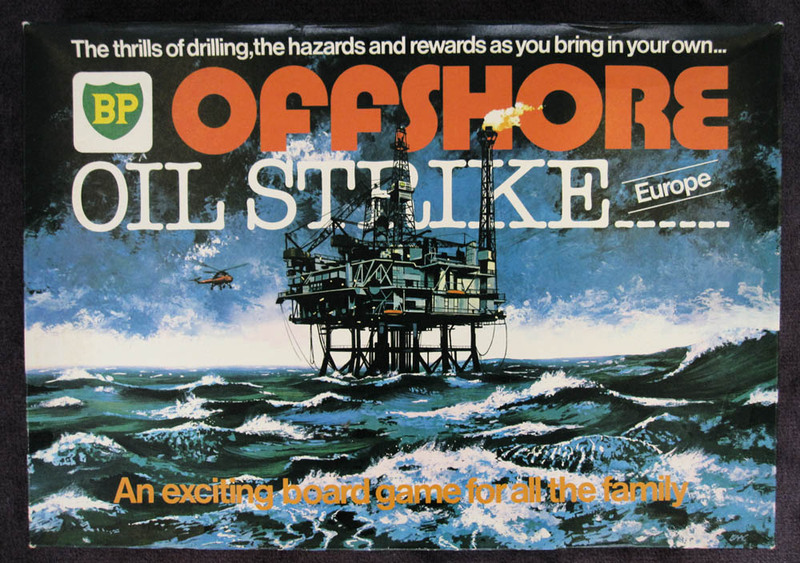 With this "exciting board game for all the family," released in 1970, BP delivered all "the thrills of drilling, the hazards and rewards as you bring in your own..."
Bring in your own "Offshore Petro-Dollars," that is. 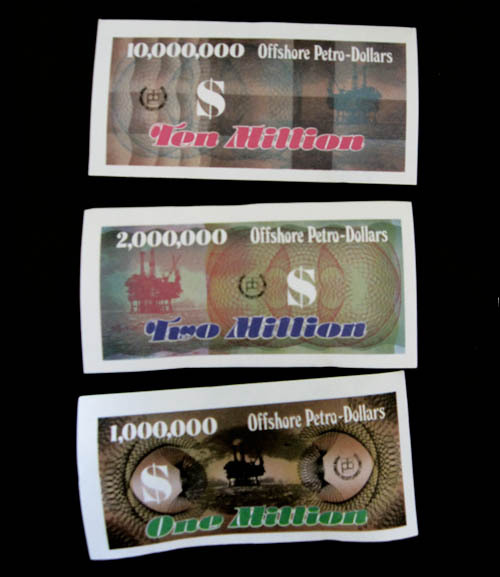 The game's internal monetary supply comes in denominations of $200,000, $500,000, $1,000,000, $2,000,000, $10,000,000, and $20,000,000—which is good because you need to earn a lot of it: "The 1st player to make $120,000,000 cash is regarded as the winner." After all, it's "a race to find and develop the riches 'neath the seabed," where no deepwater is beyond the horizon of possible drilling. —"Accident. Rig shuts down while replacement of key personnel takes place. Miss one turn." —"Fire breaks out. Pay $2,500,000 for repairs." —"Hit High-Pressure Gas—Rig Damaged. Specialists called in." —"Blow-Out! Rig Damaged. 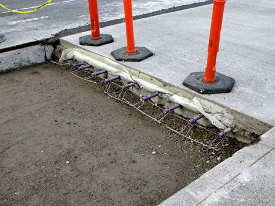 Repairs cost $2,000,000"
—"Drill pipe breaks. Pay $500,000 for replacement." —"Strike High Pressure Gas. Platform Destroyed." —"Blow-Out! Rig Damaged. Oil Slick Clean-Up costs. Pay $1,000,000." 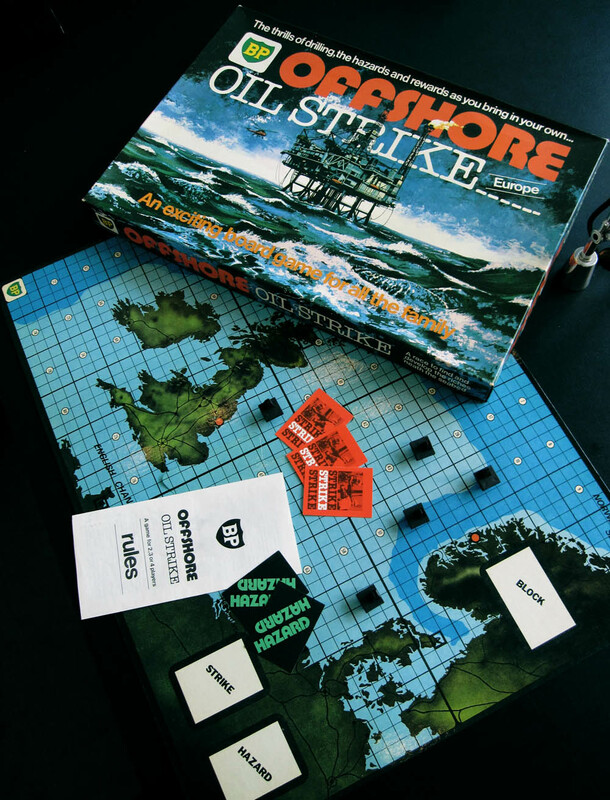 Players are assigned one of four competing oil company identities, each of which is associated with a specific urban headquarters: Chevron/Rotterdam, Mobil/Dieppe, Amoco/Bergen, and BP/Hull. As the CCA wrote in their excellent book and exhibition catalog, Sorry, Out of Gas, "Historians and researchers often see games as a source of information about the customs and concerns of a given era. 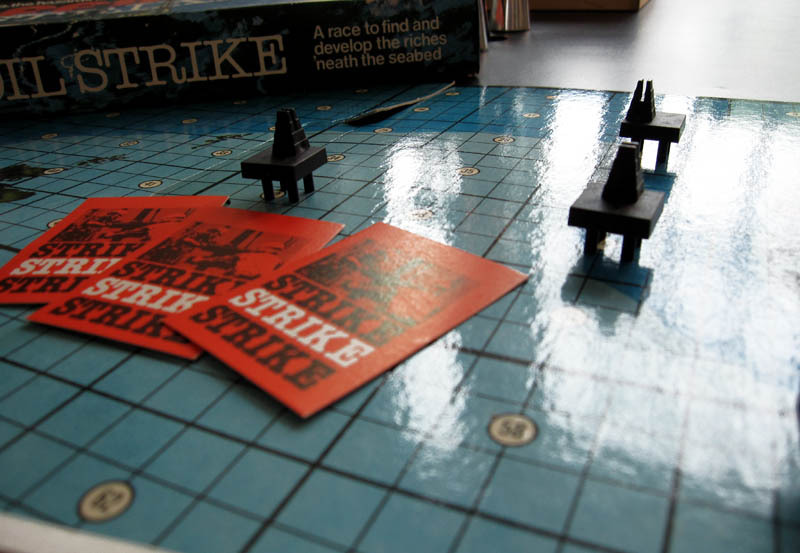 The way games work, their meanings and goals, are linked to the social context in which they are invented and popularized." 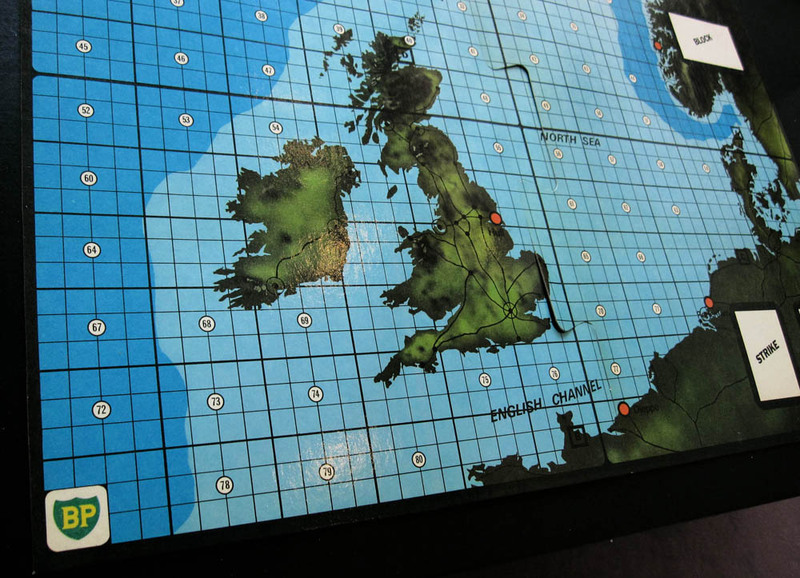 I've included several photos of BP's game here so that you can see the space of play for yourself. 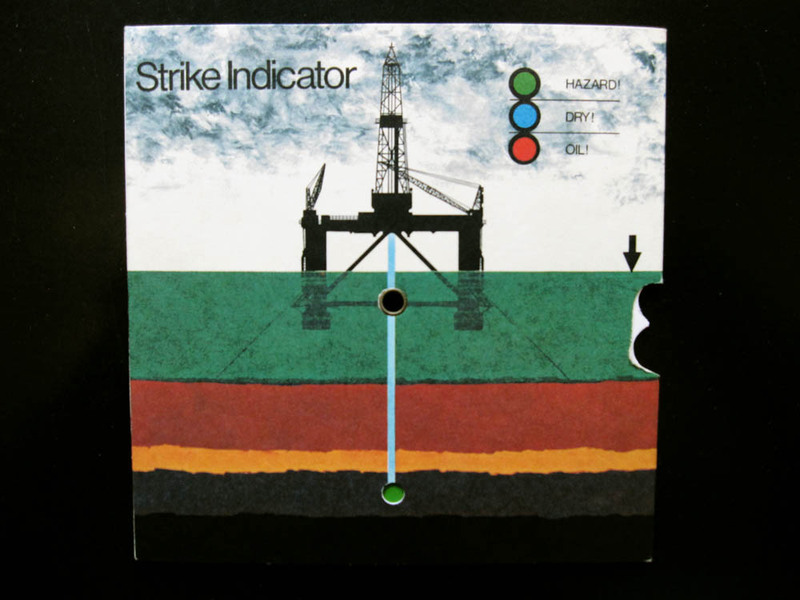 But perhaps it's time now for BP to release a new edition: Beyond Petroleum: Nightmare Well!, with whole new strategies for hazards and risks, with "Junk Shot" cards and "Top Kill" moves to deploy when needed. Perhaps they could even throw in a few special supplements for good measure: Perpetual Blow-Out! or It'll Take a Clean-Up of $6 Billion to Bring the Gulf Back! Anderson Cooper and Joe Barton could play a few rounds on national TV. 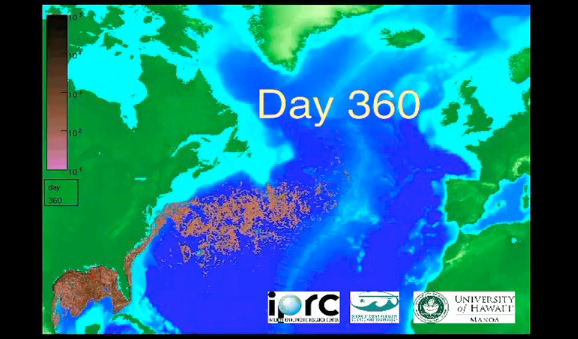 This scary simulation from the School of Ocean and Earth Science and Technology at the university of University of Hawaii shows how far the oil will spread if the Deepwater Horizon spills for a year 150 days worth of spilled oil isn't contained for a year. I'm not sure if this takes into account the oil BP is capturing or not but the point is: Let's get this contained. Nobody speaks about it that much anymore, don't they? (at least here in Europe). The headline time is over, thanks to what? football? So lets reblog and reblog so that BP continue to feel a bit the pressure (the one from the public opinion, not the one from missed drillings to save their own money). 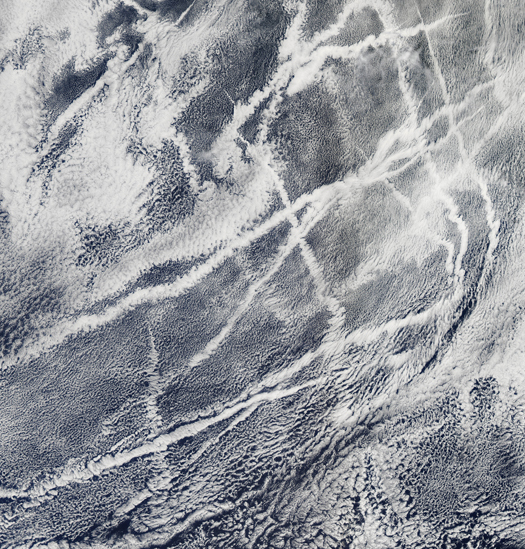 We already knew it worked in the lab, but this was a real-world test and the results are pretty impressive: a 25 to 45% reduction in oxides of nitrogen (NOx) over the special roads. 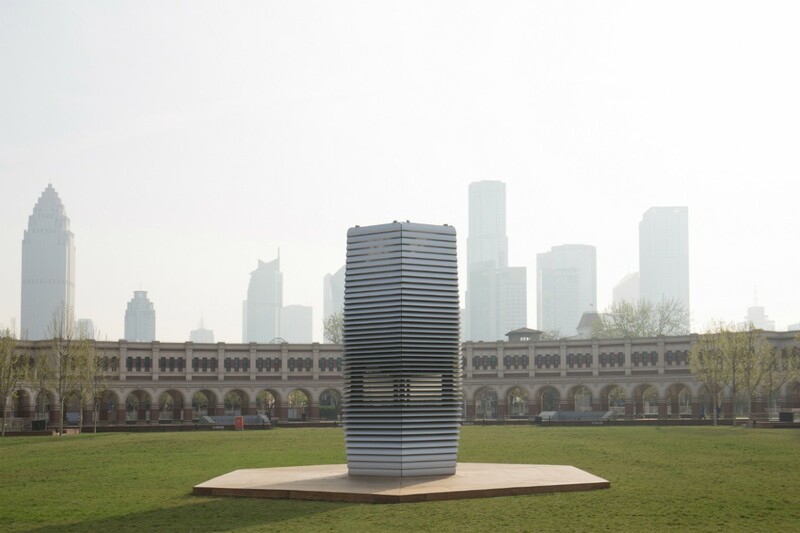 This could mean that someday our roads and other concrete structures could be used to clean up the air. This seems like a practical idea, though it is somewhat of a secondary fix that doesn't attack the root causes of pollution. However, if city dwellers decide to walk, rather than drive, on this NOx-hungry concrete, then maybe we're on to something. 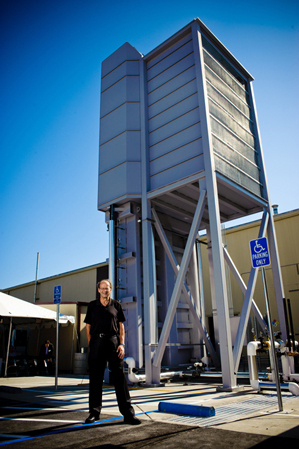 Read the Treehugger post here.